This post contains affiliate links you can use to purchase the book. If you buy the book using that link, I will receive a small commission from the sale that goes towards keeping the blog running. 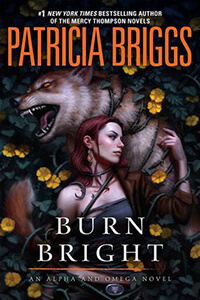 Burn Bright by Patricia Briggs begins just after the stuff with Mercy ends in Silence Fallen. Bran is still out of town leaving Charles in charge of the pack. We get introduced to a lot of the wildlings in this book as it starts out with a panicked phone call from one of them. Someone is trying to kidnap one and Charles and Anna charge to the rescue. The mystery begins on who is behind the attack on the wildlings and why. Meeting some of the wildlings and seeing just how troubled they were gave me a new respect for Bran for keeping them nearby and watching out for them. 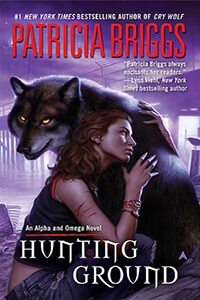 Anna’s powers as Omega of the pack are extremely important to those troubled wildlings so they latch onto her especially hard. As the hunt for a traitor goes on, I am truly hoping what Charles and Anna suspect is wrong. It puts everyone at risk. I flew through Burn Bright. I had to know just who was after the pack. The answer to who was behind the events of the book are revealed, but I don’t feel like the problem is completely solved. I feel like there is more to it. More of a military-like involvement. I couldn’t see the enemy in Burn Bright having all the things available to them that were used against the wildlings. As always, I loved Anna and Charles together. They just click. The way Anna also communicates with Brother Wolf makes her understand Charles in such a base way. Their love and bond really work to solve the mysteries that put them to the test. Burn Bright was a prime example of how these two can work together. I did become more interested in Bran and Leah’s relationship. I just find it so odd that they could be mates but she doesn’t feel that he loves her like he should love a mate, or as much as she loves him. I’m curious now. I’d like to see more from them. Burn Bright was exciting and full of adventure. It was a fast read for me as I was constantly picking it up dying to know what was going on. Definitely an enjoyable addition to the Alpha & Omega series! 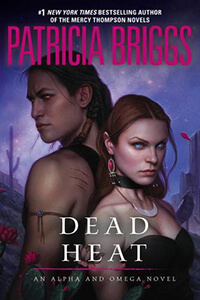 Patricia Briggs was born in Butte, Montana to a children’s librarian who passed on to her kids a love of reading and books. 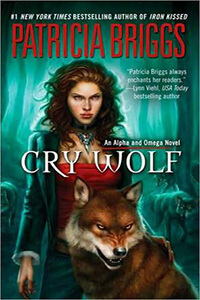 Patricia grew up reading fairy tales and books about horses, and later developed an interest in folklore and history. 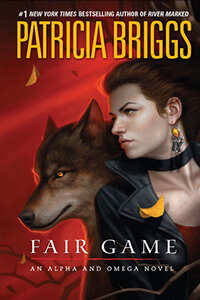 When she decided to write a book of her own, a fantasy book seemed a natural choice. Patricia graduated from Montana State University with degrees in history and German and she worked for a while as a substitute teacher. 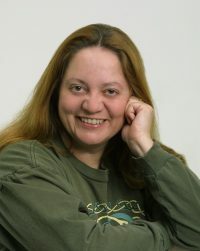 Currently, she lives in Montana with her husband, children and six horses and writes full-time, much to the delight of her fans.